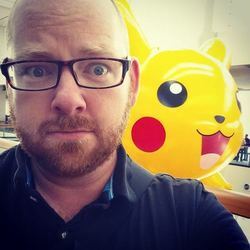 McGonnigal has been a voice actor for nearly 20 years, and in addition to "Pokémon," he can also be heard on "Yu-Gi- Oh! GX" & "5Ds" (Brron, Thunder, Blitz), "Viva Pinata" (Teddington Twingersnaps), "One Piece" (Kuromarimo, Eyelash), "Huntik" (Tersely), "Three Delivery" (Eugene), "Chaotic" (Vlar), "Weiss Kreus/Knight Hunters" (Omi), "Magic Users Club" (Takeo), "Kirby" (Whippy), "Big Windup" (Kanou), "Beck" (Yoshito), "Gokusen" (Uchiyama), "El Cazador de la Bruja" (L.A.), "Kizuna" (Ranmaru), and games including "Shadow Hearts from the New World" (Johnny Garland) and "Viva Pinata." He has also done voice work on the Cartoon Network, Fox Kids, DisneyXD, Playstation, and XBOX. Outside voice acting, McGonnigal works as an LGBTQ advocate and has produced more than 200 Broadway concerts and events. He is the recipient of the Adrian Tinsley Award for Achievement in the Arts, an International Theatre Award for arts & advocacy and the New England Theatre Conference Award for Achievement in the Arts. Alongside his husband, McGonnigal organized the rallies outside the Supreme Court during the Prop 8 and DOMA hearings and has spearheaded RootsCamp, the nation's largest convening of progressive organizers for the past five years. He can frequently be heard sharing political thought on SiriusXM Progress 127 and HuffPost. McGonnigal lives in Hyattsville, MD, with his thoroughly charming husband, Sean, and slightly more charming dog, Eli. Find out more at jamiemcg.me.